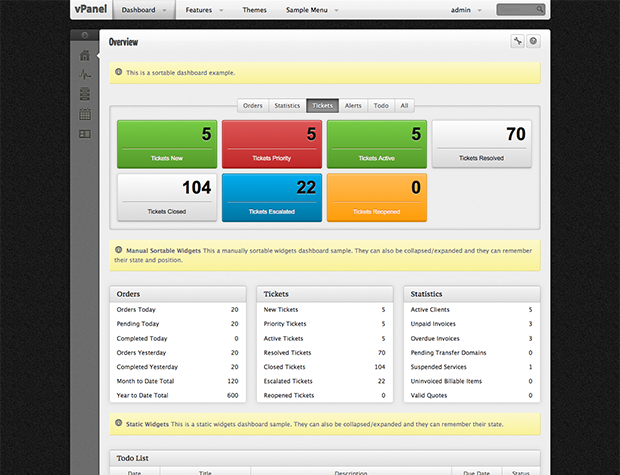 vPanel is an application framework with all the necessary features and tools you would need to build an admin panel or a software-as-a-service app. It comes with an html template version, so you can use it with other frameworks, and a zend framework ready version. I was looking for a good design for my almost finished Zend Application, and this is really looking awesome! Also it saved me from ALOT of work! I had actually been postponing adding a design to my application, just because its such a boring and slow process transforming templates into Layouts and Views etc. Luckily you did it all for me All Zend developers should really take a look at this! Ajax powered search. Enables users to quickly find and select from a pre-populated list of values as they type, leveraging searching and filtering. Uses nice and smooth functioning collapsible side menu which functions extremely smooth by collapsing the content upon clicking and could remember their state. Includes two types of listing contacts. You can either choose iphone-like searching contact-list widget or using animated and sortable jQuery Isotope. Browse and manage files easily with this built-in file manager. Widgets can be drag and drop for easier personal customization. A valid HTML5 and CSS3 that makes the theme operate across devices, operating systems and web browsers. With built-in theme manager, you can upload and save your own theme and use it whenever you wanted. This theme includes 5 builtin color scheme and 5 PSD background which you can mix and match as you like. Or you can also add your own. P.S. Like all other admin templates on themeforest, this is just a template / starter kit, not a full pledged application. Do not expect it to be able to create users and groups, that is up to you to code. Cheers!